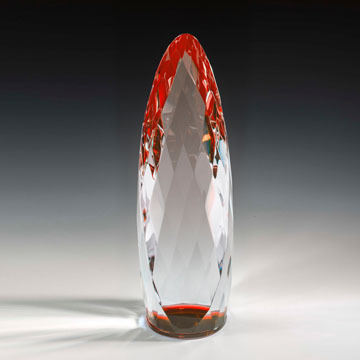 The 10" Liquidum Crystal Award with Red Accent is clear and red and is made of optic crystal. The Liquidum measures 3"W x 10"H, weighs 9 pounds and is presented in a custom blue gift box with blue satin lining. The NLQM410RD is available in 2 sizes and 2 colors with red or blue acccent including item numbers NLQM410BU, NLQM410RD, NLQM414BU and NLQM414RD. Price includes deep etch in 1 location. The imprint area is 2 3/4"W x 9"H.